Catit Design Cat Sifting Litter Box Efficiently maximizes the use of cat litter. Closed design - no mess, no odours and no dust. Simply pull the lever to sift and refresh the cat litter. Integrated carbon filter - helps control odours. 7 Kg, 67.6 x 49 x 47 cm. Behavioural Training, Daily Use, Indoor, Toilet Training. Catit Design Cat Sifting Litter Box makes scooping by hand a thing of the past. The innovative Catit SmartSift features a simple, yet practical Pull-and-Refresh system that makes litter maintenance so much easier than using a scoop. Pull lever to change litter. Easy for cats to exit. Pull the lever to change the litter - it's that simple. To refresh the litter pan, all you have to do is pull down on the lever to activate a seamless and noiseless process that quickly and efficiently sifts and disposes the waste for you. So you no longer have to use a litter scooper! SmartSift takes the chore out of litter maintenance. When you pull the lever, the cat pan inside the unit rotates and pours its contents into an integrated sifter, which collects and then deposits waste in a lined, pull-out waste bin located below. Clean litter is then recycled back into the pan, refreshed and ready for toilet duty. 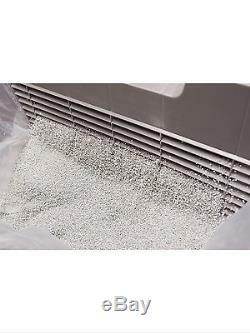 The system efficiently maximises the use of cat litter. When it's time to get rid of the sifted waste, simply pull-out the waste bin, remove the filled liner, discard, and replace with another SmartSift Biodegradable Replacement Liner. To replenish the litter, simply open the maintenance access door and add new litter. Catit Design Cat Sifting Litter Box includes a custom-fit biodegradable liner for the cat pan as well as one for the pull-out waste bin. Rich in features and benefits. Catit Design Cat Sifting Litter Box is a safe manual system, with no motorised pieces that can heat up or fail over time and no expensive electronic parts to replace. This eco friendly feature is quiet and safe, making it very cat friendly, and the units closed design provides a cosy, private area for cats. Besides the easy-to-use lever system, the cat pan also includes a carbon pad that helps control odors. There is also a large entrance for cats of all sizes, with a swinging door that closes on its own, ensuring that the unit is sealed shut, further controlling the spread of odors and dust. Catit Design Cat Sifting Litter Box is suitable for all types of clumping litter. 26L x 19W x 25H. Internal dimensions of cat pan. 19L x 13W x 17H. Top five tips for getting your cat into SmartSift. 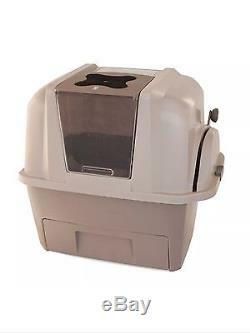 Set up Catit Design Cat Sifting Litter Box in the litter area of your home. During the transition process, keep your cat's current litter box next to SmartSift with some litter in the box and keep SmartSift's Maintenance Access Door open. 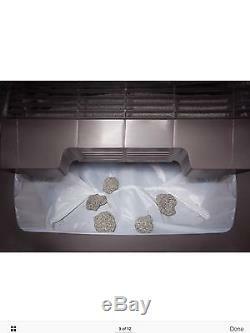 Add some used litter inside SmartSift. Mix used litter with new litter so that your cat can recognize his scent in the new litter box. Reduce the amount of litter in the old litter box and do not continue to do any maintenance to the old litter box. Remove the old litter box after your cat uses SmartSift for the first time. When your cat is used to SmartSift, try closing the Maintenance Access Door, but monitor carefully to make sure your cat transitions properly. 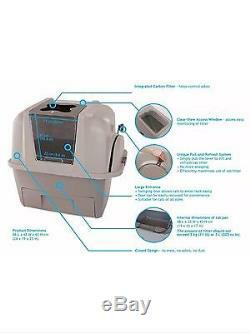 Catit Design Cat Sifting Litter Box Features. 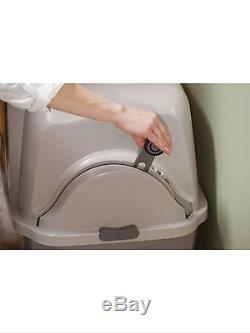 Collects waste clumps for easy disposal. Includes convenient storage for replacement liners. Holds up to 2 weeks worth of waste (depending on number of cats per household). Provides easy access to cat pan. Simply lift up to add new litter. Works with all types of clumping litter. Dual Cat Pan Liners - Included. We all so sell spare cat tray liners if required. Please check out my other items. The item "Catit Design Cat Sifting Litter Box Toilet Easy Clean Smart Sift Pet Supplies" is in sale since Sunday, January 15, 2017. This item is in the category "Pet Supplies\Cat Supplies\Litter Trays". The seller is "wwwsharpspetworldcouk" and is located in PUDSEY, West Yorkshire. This item can be shipped to United Kingdom.